In this the seventh in the series featuring Ruth Galloway, a forensic archaeologist, the historical find is the body of a pilot in a WWII plane. The hapless Barry West who came across the plane while clearing the ground for a new development of luxury homes. After recovering from the shock he calls the police and the excavation of the plane begins. When Ruth is called by DI Harry Nelson she is convinced that the pilot hasn’t been there since the end of the war. That raises plenty of questions not least whose body is it, where has it been and who moved him to the plane and why? So quite a lot to discover and the place to start is the family who used to own the land the plane was found on; the Blackstock family have been in Norfolk for centuries. There is plenty to get involved in this book from the array of personal and work relationships that have woven their way into the story. Judy is now having her second child with the druid Cathbad and although his role in this book is more muted than previously, it was good to see how life was treating him now that he lives in a house with his family. Ruth also gets to meet up with Frank who she met whilst filming the TV series in The Outcast Dead and of course her boss Phil is trying to muscle latest action. All the catching up with these well-known characters is part of the enjoyment of reading this series, but to get the full story arc, you do need to begin at the start of the series although it could be read as a stand-alone. The mystery itself is surrounded by a colourful array of characters, whilst avoiding stereotypes, these are recognisable people even if some of them are not the kind that you would want to be friends with. 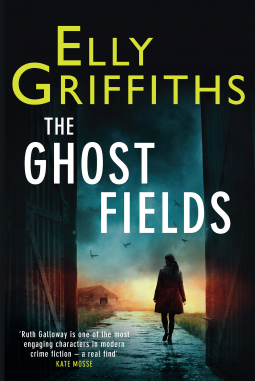 As always Elly Griffiths gives us a good sense of place with the Norfolk landscape vividly described overlaid with a stifling hot summer which transported me right to the centre of the action. The storyline is also helped with some gentle humour so that despite the race to find a killer in the present as well as solving the mystery of the past this doesn’t feel gloomy. Of course the link to the ghost fields in the title which is the name for the disused American air bases that were situated in the UK was of real interest to me as is the delving into the family history of the long established Blackstock family which results in some interesting revelations. This is an all-round good read, satisfying and comforting as well as informative. I’m already looking forward to the next book. I’d like to thank the publishers Quercus for allowing me to read a copy of this book ahead of the publication date of 26 March 2015. Oh, Cleo, this is one of my top series! It’s good to know that this one lives up to the quality of the others. I have to say that one of the many great things about these novels is the past murder(s)/present murder(s) connections. Thanks for a great review. Thank you Margot, Elly Griffiths certainly knows how to write a good story doesn’t she? I enjoyed the combination of family history with the usual forensics in this one. It also struck me how much I enjoyed catching up with the character’s lives. She is one of those authors who can weave a great story that’s for sure. I really enjoyed this one and she’s definitely on my must-read list. Great review, Cleo! I’ve got to start reading the Ruth Galloway series! I’ve just caught up with The Outcast Dead – can’t wait to read this one too! Ruth always comes across as a very human, likeable person – great character.